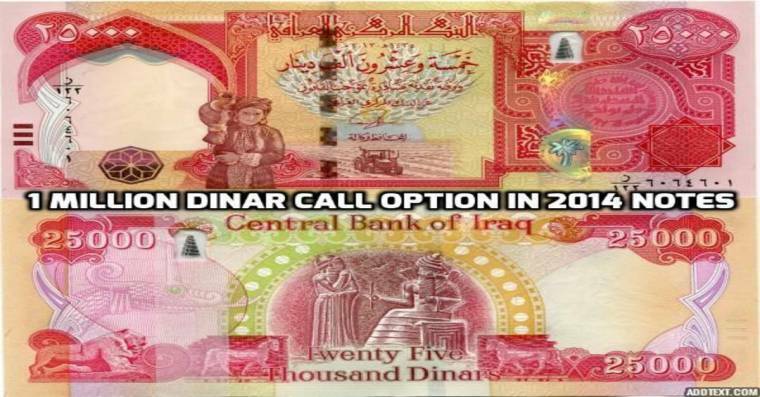 Please note this option is for current issue(year 2014/2015 - Latest Issue) Iraqi Dinars in 25000 or 50 000 denomination notes (depending on availability) at a strike price of $1145 , if they are re denominated (zero lopped) for any reason, the position you hold will be adjusted accordingly , again if you need more clarification , email us please . We accept Payment for these options via online payment , Western Union or SEPA bank transfer (email for details) . Bitcoin also welcome. If you wish to Exercise and take possession of the Dinars prior to expiry of this option , payment is only via Bank transfer or Western Union .